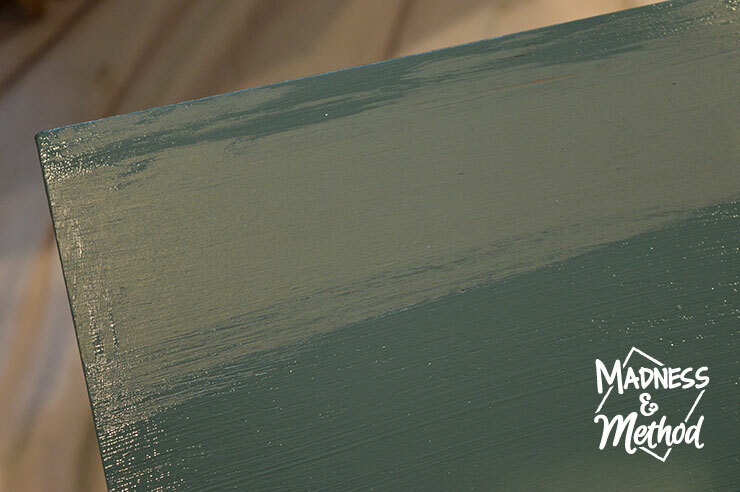 Have you heard of a two-toned or painted and stained dresser before? 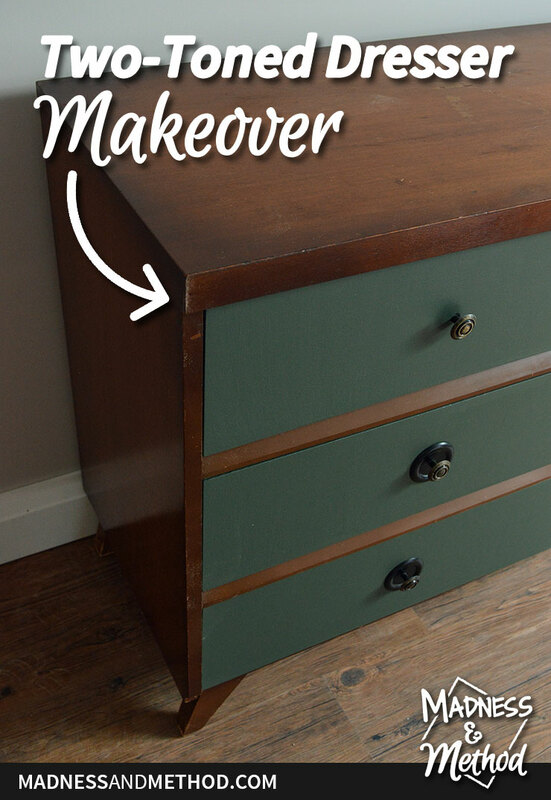 This dresser makeover has the perfect combination with stained top and painted drawers! It’s the second week of the Spring One Room Challenge, and this season I’m attempting to makeover not one, but two master bedrooms! 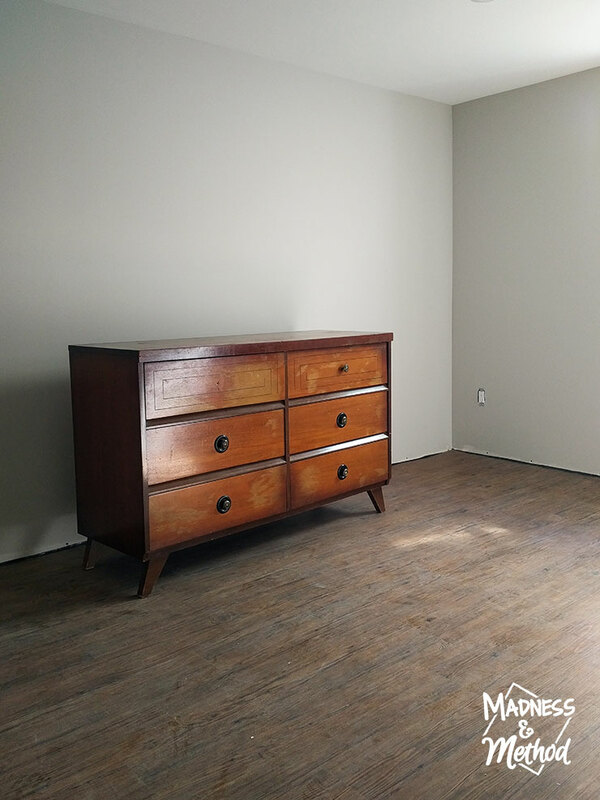 This week we focused our efforts on the bedroom at the rental renovation (aka the bright basement bedroom) and I did the painted and stained dresser makeover that I had been planning! 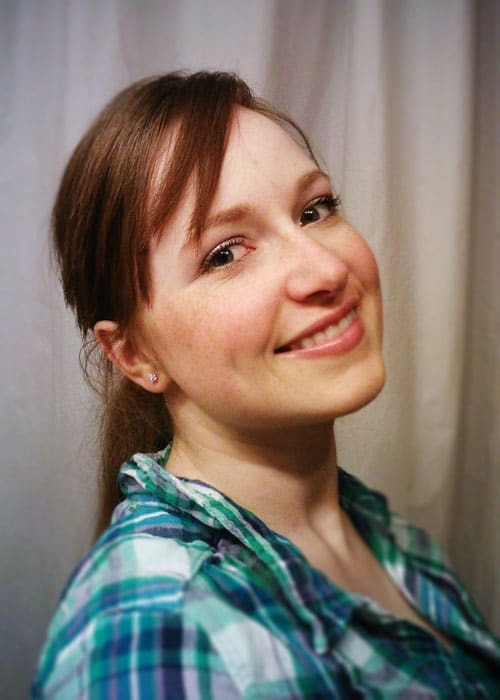 Let me show you how it turned out, and I’ll give you an overview of what’s coming up next. 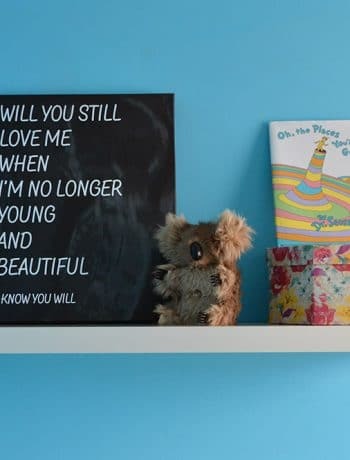 I know I mentioned that we’re renovating this bedroom as part of the One Room Challenge, but if you’ve never heard of this before – you need to check out the One Room Challenge website and see all the details! Basically, this super awesome lady name Linda came up with the idea to have 20 designers/bloggers makeover a space in 6 weeks, and everyone else is invited to do their own rooms as a linking participant. I went over more details about my past times doing the One Room Challenge in the first-week post here, so check it out if you would like to catch up! 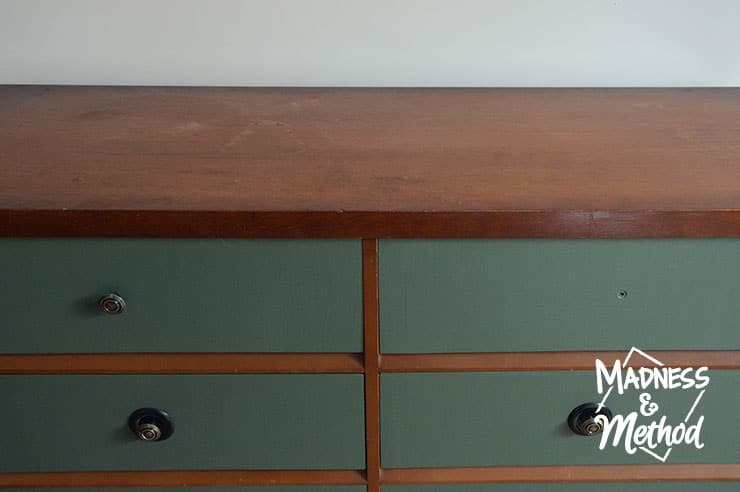 But let’s talk about my completed project so far: this two-toned dresser makeover! 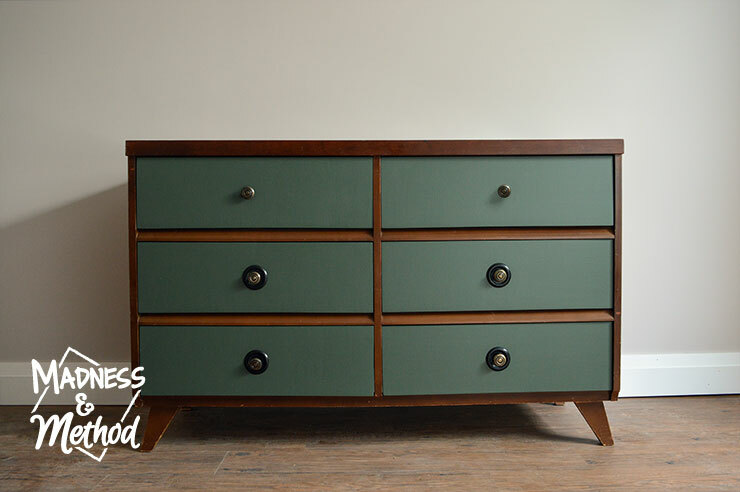 I had been wanted to do a two-toned dresser for a while now because I’ve really liked the combo of a painted and stained dresser. 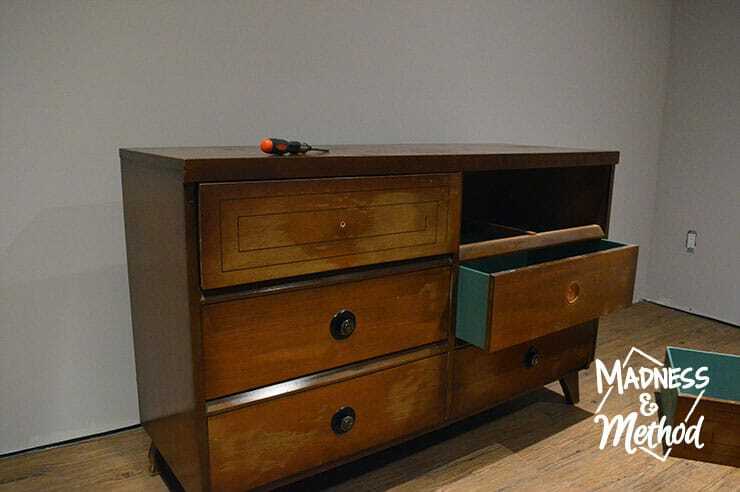 Because we purchased a second home, I knew that I needed to buy a few furniture items for when we rent out the space short-term, so figured I could find some a good dresser candidate! 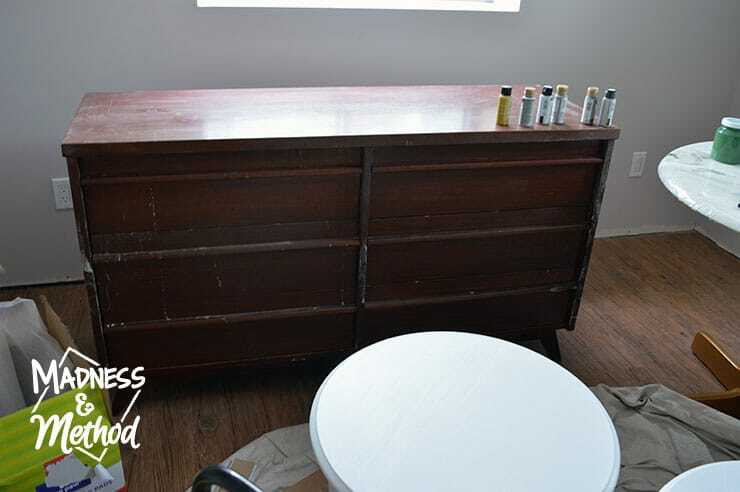 We actually purchased this dresser second-hand in the fall, and I’ve been waiting to give it a good makeover ever since! 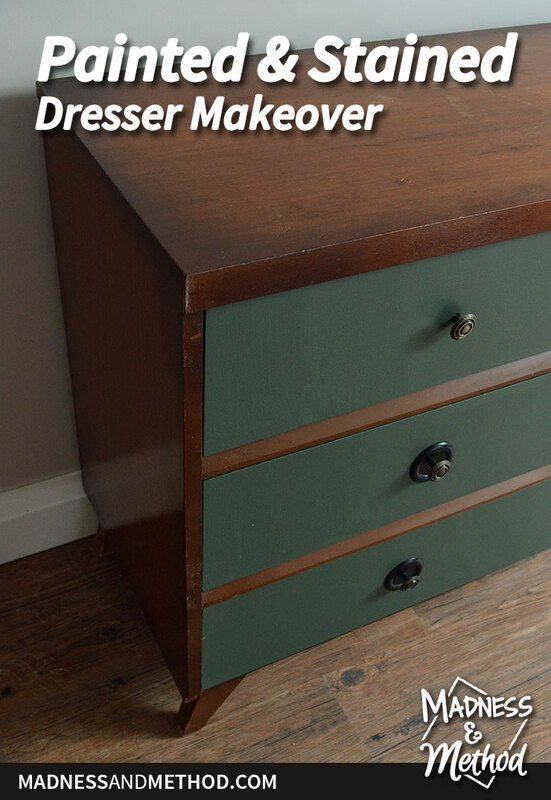 The dressers had some wear spots on them (and a couple on the top), but other than that, it was a sturdy all wood piece. 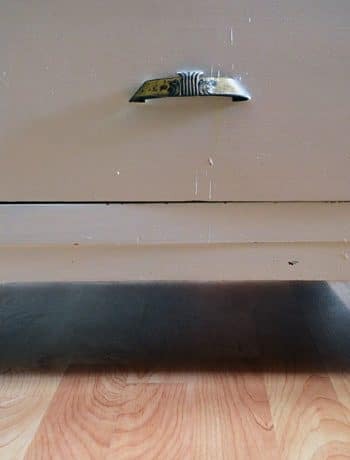 Because the drawers were in worse condition (and I didn’t like the weird lines on the top ones), I figured that it would be a good idea to paint those, and leave the top/sides stained. The dresser had just been sitting upstairs at the rental and we sort of used it to hold stuff but moved it downstairs a couple of weeks ago. 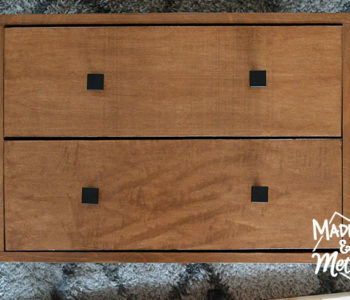 I took off all the hardware, than gave the drawers a good sanding (I have more details in the video below if you wanted to watch that!). When we moved the dresser downstairs, one random piece came off and we couldn’t figure out where it came from. 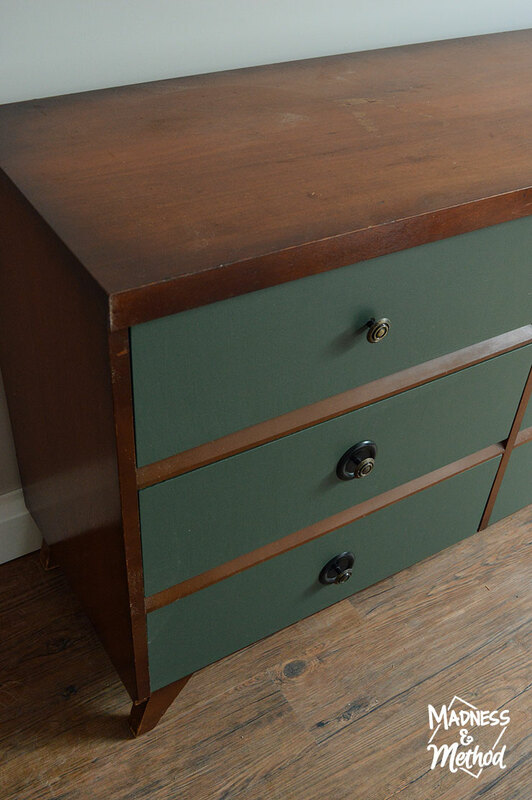 Turns out it was just one of the drawer slides, so I’ll have it install that back on :) I picked up a few colours of Fusion Mineral paint, and gave all the drawers a coat of Bayberry. While I did like the colour in general, it wasn’t really what I was going for (and I anticipated that, so had a couple of other colours to test out as well!). Using my already painted paintbrush, I dipped it in Ash and tested that on the drawer, and the colour Park Bench on another drawer. (So essentially each colour was mixed a bit with the one before). Once they dried, I had a better idea of what they looked like, and knew that the Ash mix was a bit too dark and blue, the Park Bench mix was pretty close to what I was going for, but I did want it still a bit darker and more muted (kind of like a darker Bayberry). 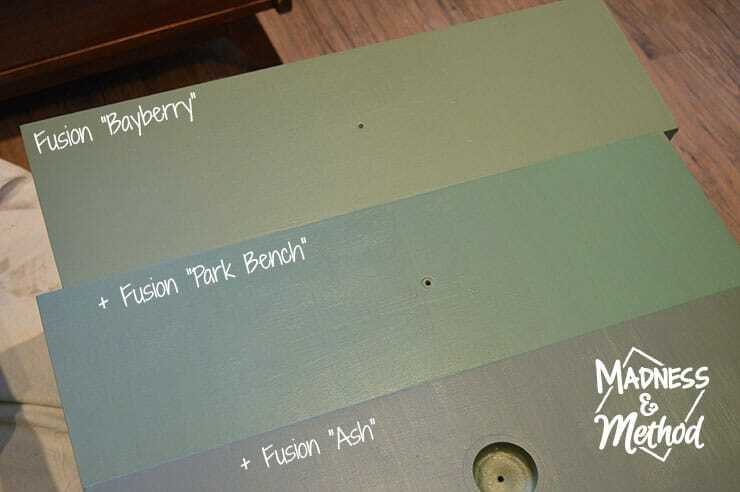 I came up with a custom blend, which was probably 2 parts Bayberry, 1 part Ash and 2 parts Park Bench. 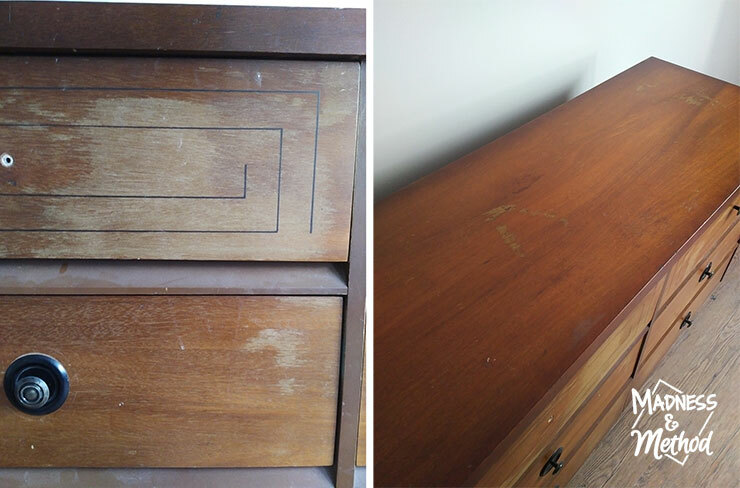 The photo above shows it freshly painted on one of the original/Bayberry drawers, and it dried really nicely! I loosely put the hardware back on (I still need to get a bolt for one of the knobs!) to see how it would look. It was a bit tricky to capture the colour because it was a cloudy day (and the lights are pretty warm down here) but I managed to get it as life-matching as possible. 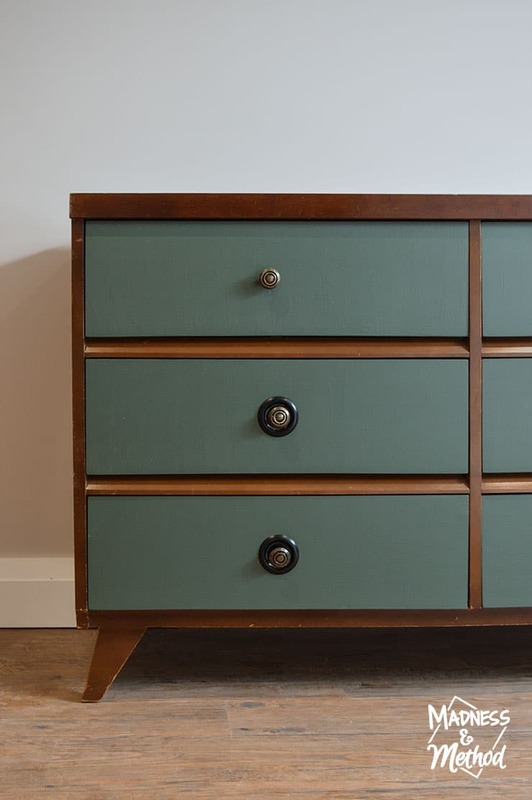 If you had never heard of a two-toned dresser or thought that the combination of a painted and stained dresser would be weird… let me know what you think! The top is a bit better looking before (I was originally planning on sanding everything and re-staining it… but it’s like 95% good so I skipped all the hard work, ha!). Basically, I just tried to darken the water/dry spots with some somewhat matching gel stain, and also gave the dry spots a bit of a polish. The edges were a bit worn too (and some areas on the feet), but I did the same gel stain to darken them so they’re not as contrasting as before. I’m thinking that the knobs should be a brass colour instead so they pop a bit more. But that’s progress in the right direction! For the other bedroom, I’ve also purchased all the wood for the headboard builds AND most of the wood I needed for the nightstands. 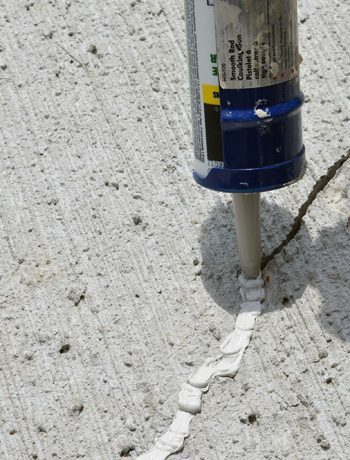 My plan is to start both of those projects this weekend because I’m anticipating that I might run into some snags (especially with the nightstands) and that way I’ll have time to figure stuff out. I think I covered everything in this post and/or on the video! Let me know if you have any questions, and for those wondering about all the other rooms at the rental renovation (like the living room, bathroom or kitchen) we’ll hopefully be sharing them soon enough after the One Room Challenge is done. 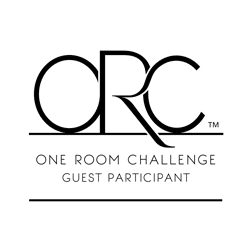 And if you’re looking for more design in the meantime, make sure to check out the One Room Challenge website for hundreds more projects being completed this round! 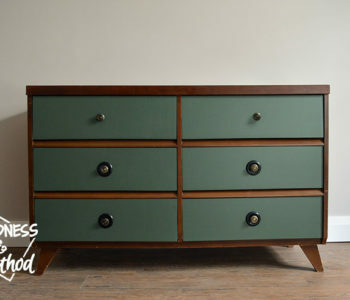 Oh, and I also have a second dresser that I want to do another two-toned painted and stained look as well, but this time I’ll be keeping the drawers stained and painting the tops/front/sides. And those are the nightstands that I have painted white, getting ready for their paint pour marble treatment soon! Feel free to save either of those images to Pinterest :) And make sure to let me know what you think of the painted and stained dresser makeover too! I think it will be a nice addition to the room and will add a fun pop of colour in our super neutral space. 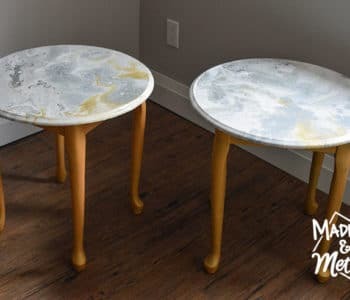 And, come back next week to see what I’m sharing next :) It will be a surprise to me too – but I’m thinking either the paint pour marble nightstands, or the headboard builds… so I better get those started, ha!